The index opened weak but saw some buying interest to touch the highs around 7688, only to be sold to the lows of the day at 7640. Buying at lower levels say the index back in green only to be sold-off again to close at 7649.25, a small loss of 22.80 points. The broader market was also weak, with 557 advances to 969 declines. Range for the time being has narrowed down to 7500-8000. 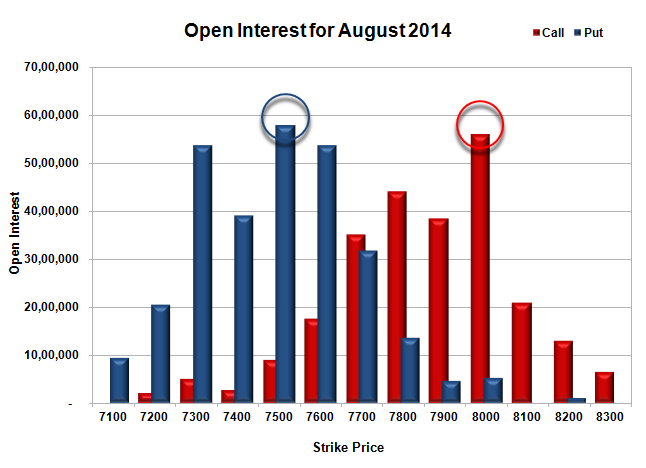 Call option 7800 added huge 1.49 lacs OI with profit booking seen at 7900 and above strike prices. Put option 7500-7400 added huge 0.86 lacs OI with short covering seen at 7700 and above strike price. Nifty Open Interest is at 1,30,92,300 down by 6,37,850, with decrease in price, most probably huge long liquidation. Bank Nifty Open Interest is at 14,51,375 down by 22,600, with decrease in price, most probably long liquidation. FII’s sold 5.49 lacs Futures, which includes 15605 contracts long liquidation and 4620 contracts short covering, with increase in net OI by 20225 contracts (includes 42834 longs to 53819 shorts for the day) and the average price per contract comes to around 7652.17. FII’s Index future open contract as on date is 166964 Longs to 98100 Shorts. PCR Open Interest (Volume) is down to 1.041. Initial and very good support still at 7600, with huge OI of 53.79, whereas best support at 7500 with highest OI of 57.86 lacs. 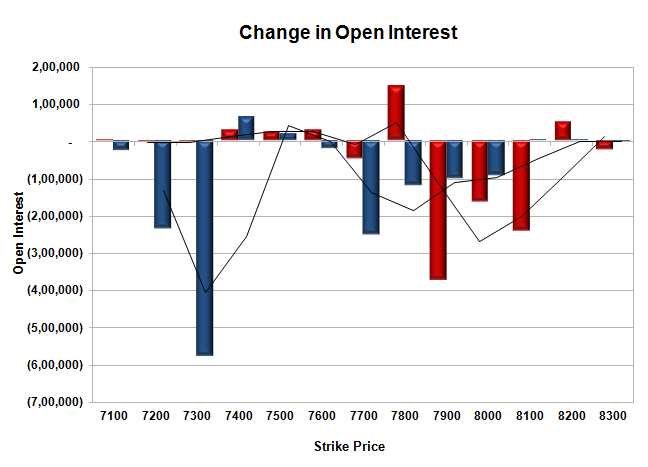 Initial resistance now at 7700, with OI of 35.12 lacs, whereas best resistance still at 8000 with OI of 55.99 lacs. 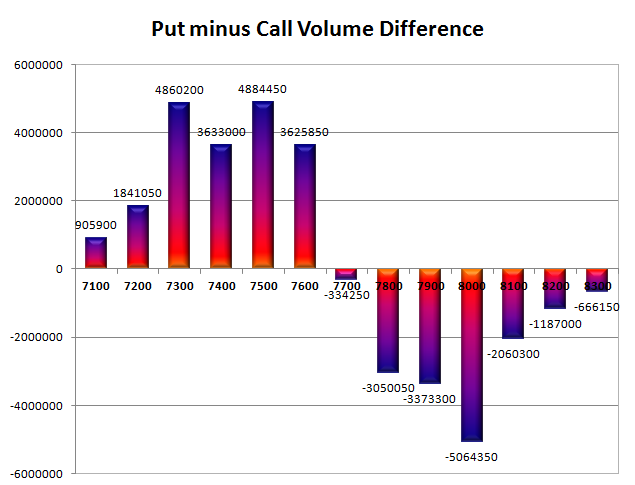 Day Range as per Option Table is 7594 - 7727 and as per VIX is 7593 - 7706 with 7663 as the Pivot.